Meditation for Bipolar: Can Mediation Help People With Bipolar? Living with bipolar disorder can be an unsettling, disquieting, and difficult experience – to put it mildly. Many who struggle with this illness hear a relentless stream of voices in their head, which can make daily life almost unbearable and restful sleep downright impossible. Others feel incredibly uncomfortable in their own skin – as if they want to crawl out of their own body and find someplace else in the world to call home, one that offers refuge from the bipolar bugaboos. I can relate to both experiences. While I don’t know about you, but I have been in hot pursuit of solutions to the often unmanageable symptoms brought on by bipolar disorder since I was diagnosed 12 years ago. I have found some things that have helped – including medicine, although I still hate taking it – and I am always happy to share what has worked for me with those who also live with this maddening diagnosis. I joined a Zen meditation group about a year ago, and it has worked wonders for me. It has given me an invaluable tool to quiet my mind, and it allows me to be present in my own body without feeling an overwhelming need to escape from it. Why? Because the last thing in the world I wanted to do was to sit quietly with myself and listen to my own thoughts. Quite frankly, the idea of meditation terrified me. But, last year, I found myself running out of options. For example, I had been to every support group and 12-Step community you could think of. I tried singing loudly in regular church services. Also, I was on a cocktail of psych meds that seemed to be helping, but not entirely doing the trick. I had clocked untold hours on the proverbial couch of several qualified psychologists. The only thing I hadn’t tried was meditation – so I decided I didn’t have anything to lose. I found a local meditation group on Meetup, and I went with an open mind. The results have been surprising. It actually works! So, without further ado, let’s talk a little bit about meditation. Maybe after reading this article, you will throw caution to the wind and give it a try. Meditation (also referred to as “mindfulness”) is an ancient practice that is said to have originated in India thousands of years ago. There are many definitions assigned to the word “meditation,” but my favorite is the Buddhist explanation which says that meditation is a conscious effort to change how the mind works. Although there are many different approaches to meditation, the practice is a quieting of the mind where you reach a sacred space that transcends thought. Ironically, to reach this place, you first have to be willing to sit with the mental chatter and allow yourself to be unmoved by it. The good news is, the more you meditate, the more quickly you move through the chatter. Also, you don’t just benefit from meditation while you are doing it. The effects stay with you long after you stop meditating. Meditation is probably one of the most uncomplicated practices there is on planet Earth, but our minds want to complicate it. You don’t need any specialized equipment for meditating, and you don’t need to go to a class or workshop to learn how to do it. You just sit in the silence. 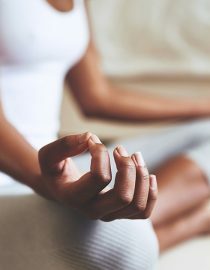 Next Page: The benefits of meditation for people with bipolar, the different types of meditation, and meditation tips.